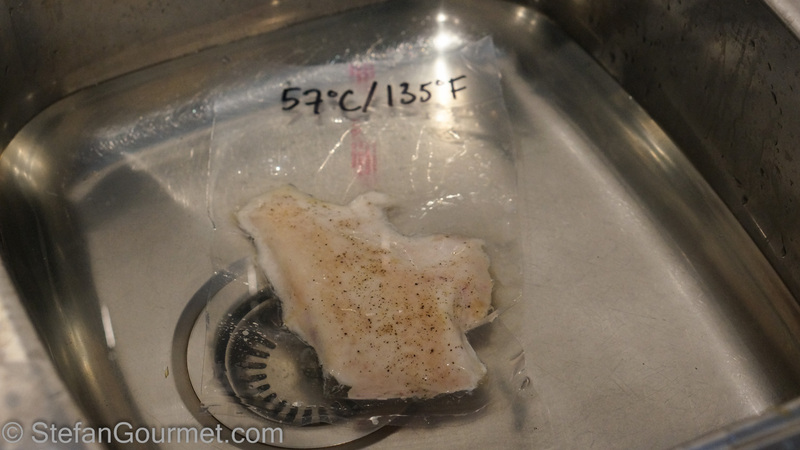 It’s been a while since I’ve done my last sous-vide temperature experiment. There is one I have been wondering about, and that is chicken breast. 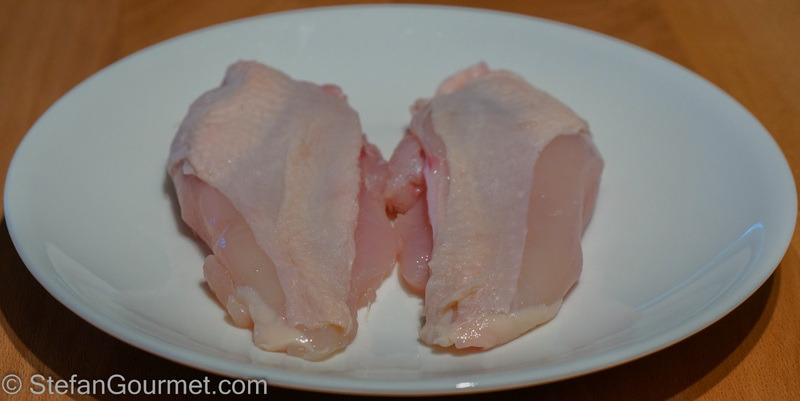 I don’t prepare chicken breast often, because I think chicken thighs have better flavor and are less prone to becoming dry. I prefer to cook most meat ‘medium rare’ whenever possible, and for chicken breast that would be cooked to a temperature of 57ºC/135ºF. 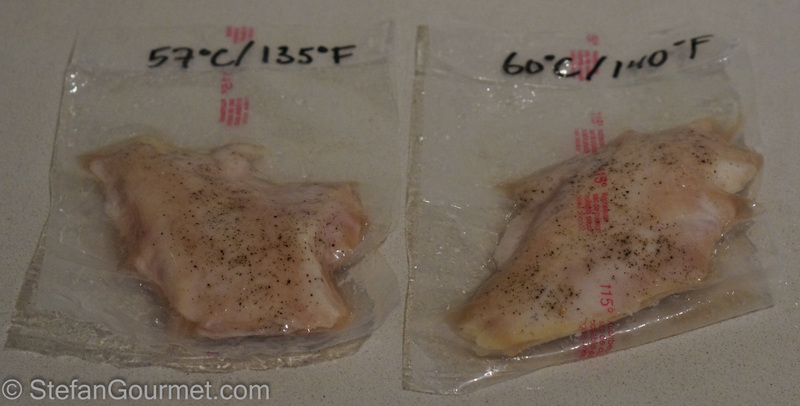 This is what I have been using, but most other recipes I’ve seen for chicken breast sous-vide, including Modernist Cuisine, use a temperature of 60ºC/140ºF instead. This is what I would call ‘medium’ for chicken breast. Modernist Cuisine states they prefer the texture. And so it was time for another side by side experiment. I started with the breast of a free range chicken. Both halves came from the same chicken, so it is a fair experiment. I seasoned them with salt and freshly ground black pepper, and vacuum sealed them. 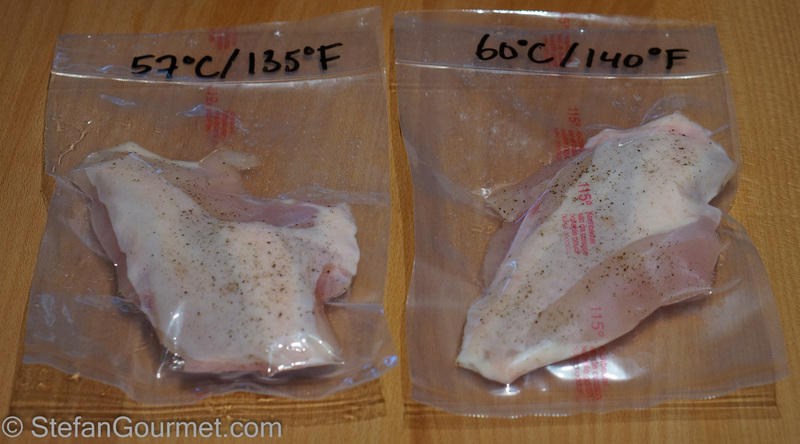 I refrigerated one and cooked the other sous-vide for 1 hour at 57ºC/135ºF. Then I quickly chilled it in (ice) cold water and refrigerated it, while the sous-vide cooker heated up to 60ºC/140ºF for the other chicken breast. 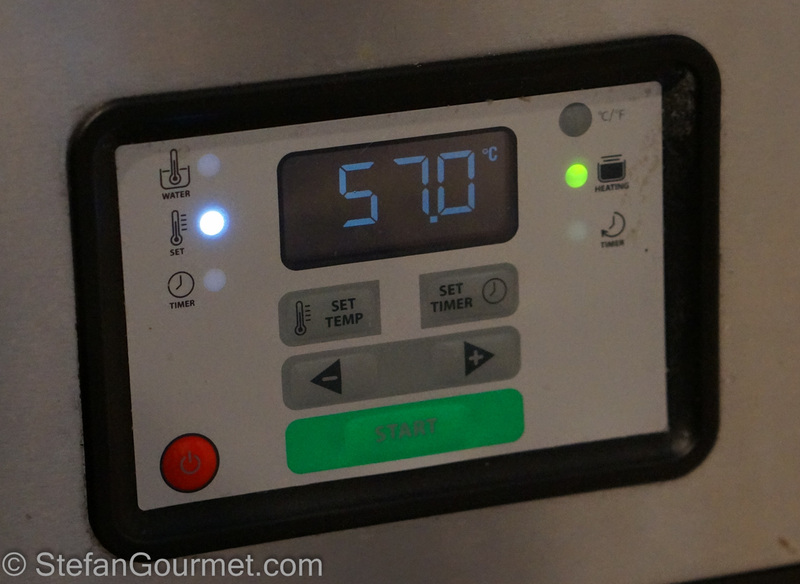 I cooked that one for 1 hour at 60ºC/140ºF and also chilled and refrigerated it. To try and make the comparison as fair as possible, I chilled both. 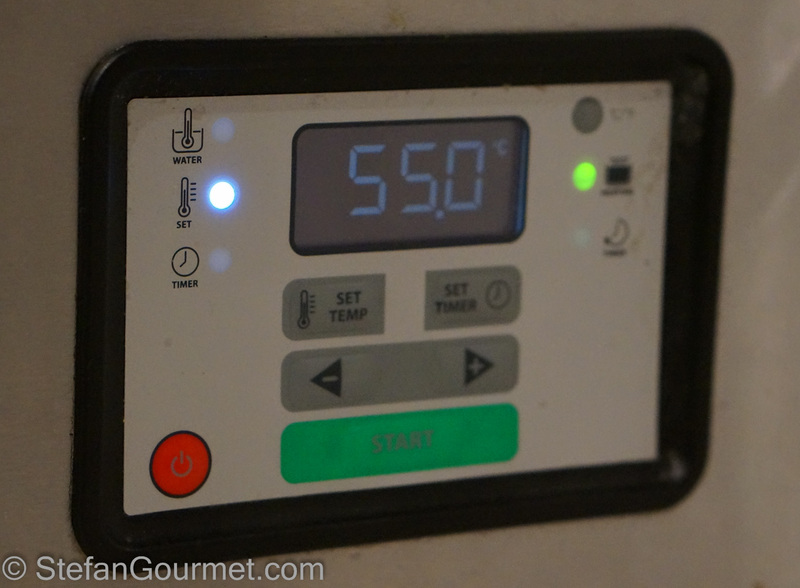 When it was dinner time, I set the water bath to 55ºC/131ºF to warm up the chicken breasts for 20 minutes or so, just enough to warm them through. This temperature will hardly ‘cook’ them any further. When they came out of the water bath, only a slight difference could be detected. 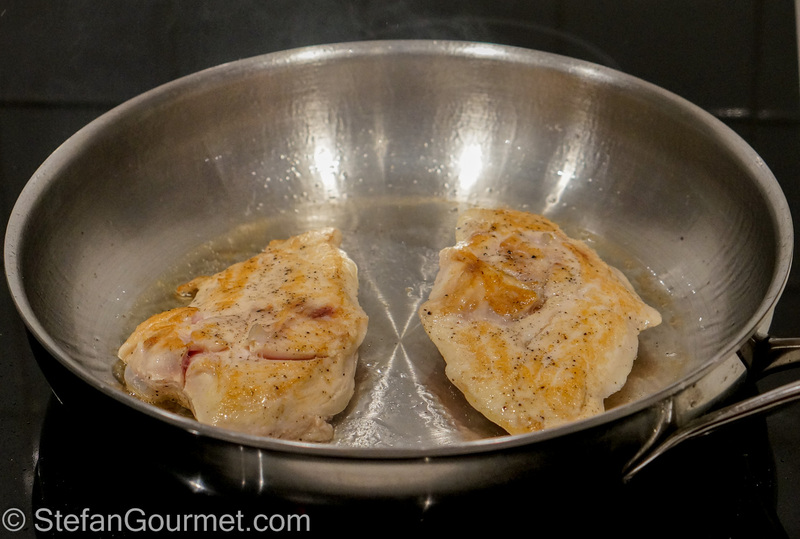 The 60ºC/140ºF chicken breast was slightly firmer and was slightly ’rounder’ (as in contracted just a bit and had become less flat) than the 57ºC/135ºF chicken breast. …and browned them quickly over high heat in clarified butter. It was not easy to see the difference, but it was possible to taste it. Both were tender and juicy. 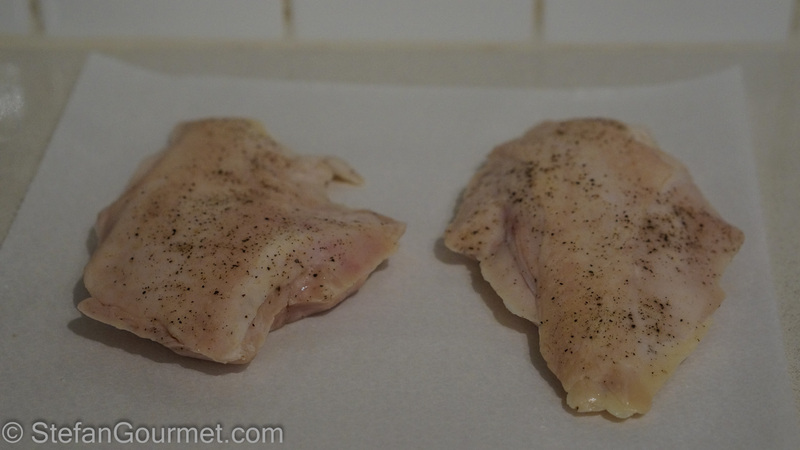 The 57ºC/135ºF chicken breast was slightly less tender but slightly more juicy. The 60ºC/140ºF chicken breast was slightly less juicy but slightly more tender. The verdict? I can see why Modernist Cuisine says they prefer the texture at 60ºC/140ºF, but I must say that both are fine and the difference is so small that I don’t think most people would notice it outside of a side by side experiment. 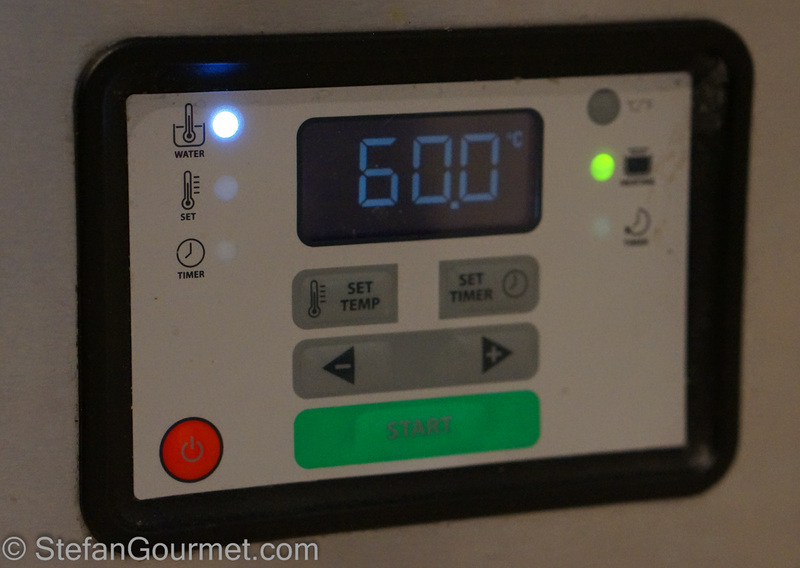 Another advantage of using 60ºC/140ºF is that a shorter cooking time will suffice to achieve pasteurization (20 minutes instead of 33). Such precision, I could not muster enough patience to do what you do. Yet makes for an interesting experiment. LOL. With long cooking times (as in, 48-72 hours), a difference of 2 degrees fahrenheit will make a noticeable difference in the final texture and juiciness. There is really no reason to go above 140 degrees for chicken breast. Your time experiment would be interesting. Let me know what you find out! I think the texture may become too soft after 4 hours.